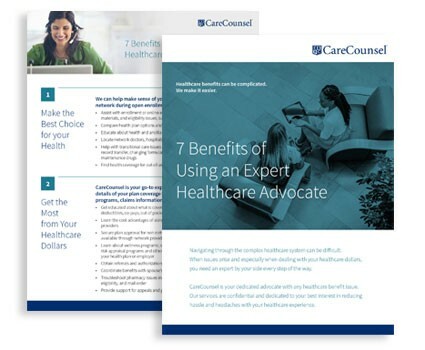 CareCounsel offers a full range of advocacy services that can help employees, retirees and family members handle any health benefit decision or concern. We are a single point of contact for employees until the issue is resolved. For more than 20 years, our team has helped thousands of people get a better experience with less hassle, less frustration and better results. CareCounsel’s personalized approach to patient advocacy includes a high-touch contact center dedicated to serving and supporting individuals in their navigation of today's complex healthcare landscape. Our program can be customized to meet the needs of the employer or retiree group. Kathy was amazing! She truly advocated for me, helping me secure services my son really needed but which were not available in network in my area. She was so persistent. I could never have managed it without her. It's so rare to hear a good news story about health insurance providers and their staff! Fill out the form to download more information about the benefits of being a member of CareCounsel.